Members of your team are always so very helpful and a pleasure to work with!! We have looked and looked for a place where we could vacation and actually relax and enjoy each other. We believe we have found this place with the home that we have rented with Navarre Properties for the last 2 Florida vacations. When vacationing in Florida we have me & my husband, kids & spouses, & grandchildren. We thank you for allowing to stay with you all and cannot wait to go back!!!! All experiences were good. Only had booking and check in experience though. We had no problems or complaints, so didn't have any other contact. We were very pleased with all aspects. It is a wonderful place if you are there to just kick back and relax. I personally would have liked a little more shopping closer but the property was wonderful. Friendly and responsive. There was no one in the office the morning I checked out. An overall great experience. It just wasn't long enough! What a wonderful place to vacation!! The condo was beautiful!! Condo was good. Guest above us was rude, drunk and threw stuff off balcony like beer cans, pickles and water on us. Didnt like the younger group above us. 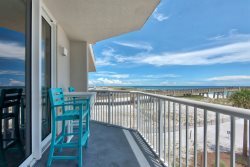 We've stayed in Navarre the last 6 years and this was by far our favorite condo. Our only "complaint" was more seating was needed in the living room--like a sectional. Everything else was perfect! The pictures of the property were spot on! The view and proximity to the beach was 5 star! As always, the staff with Navarre Properties are top notch with customer service! This is our home away from home and are looking forward to our next visit before we even leave.